Euro 2016 hosts France began the tournament as favourites but if they are to claim their third European title, Didier Deschamps team will need to overcome world champions Germany in Thursday’s semi-final in Marseille. Germany may have injury worries ahead of the game at the Stade Velodrome but they do have history on their side – not since the 1958 World Cup have they lost to the French in a competitive game. World Cup semi-final losses in 1982 and 1986 and, most recently, a 1-0 quarter-final defeat at the 2014 World Cup in Brazil, have made the Germans something of a bogey team for the French. 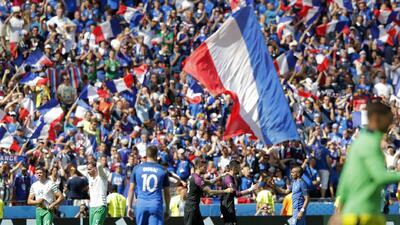 “It will be a huge match, and we have to give our all,” said Deschamps. But while Germany have experience on their side, the French look to be in the better form. Olivier Giroud scored twice on Sunday as Les Bleus beat Iceland 5-2 at the Stade de France, with several of Deschamps key players delivering top performances. Dimitri Payet and Paul Pogba in midfield look in prime shape to take on Toni Kroos and Mesut Ozil in the battle for control of the centre of the park, while up-front Antoine Griezmann’s clever and incisive movement has allowed the oft-criticised Giroud to shine. Germany didn’t sparkle against a well-organised Italy team, winning on penalties after the game ended as a 1-1 draw after extra-time. The effort also came at a price for coach Joachim Loew who will be forced to make changes to his team due to injuries and a suspension. Striker Mario Gomez, whose two goals helped the world champions to the last four, has been forced out of the rest of the tournament with a pulled hamstring. Holding midfielder Sami Khedira will also miss out because of a groin injury. Crucial central defender Mats Hummels completes the trio of absentees, sitting out the game due to suspension following a second booking. The German boss has to decide what to do with his forward line and whether to use Mario Goetze, Lukas Podolski, Thomas Mueller or Leroy Sane in Gomez’s role as the target man. Loew is likely to use Emre Can as Khedira’s replacement in midfield with Benedikt Hoewedes slipping into the central defence for Hummels. “We respect France, that’s clear, but independent of our personnel situation, we know exactly what we have to do,” Loew said.